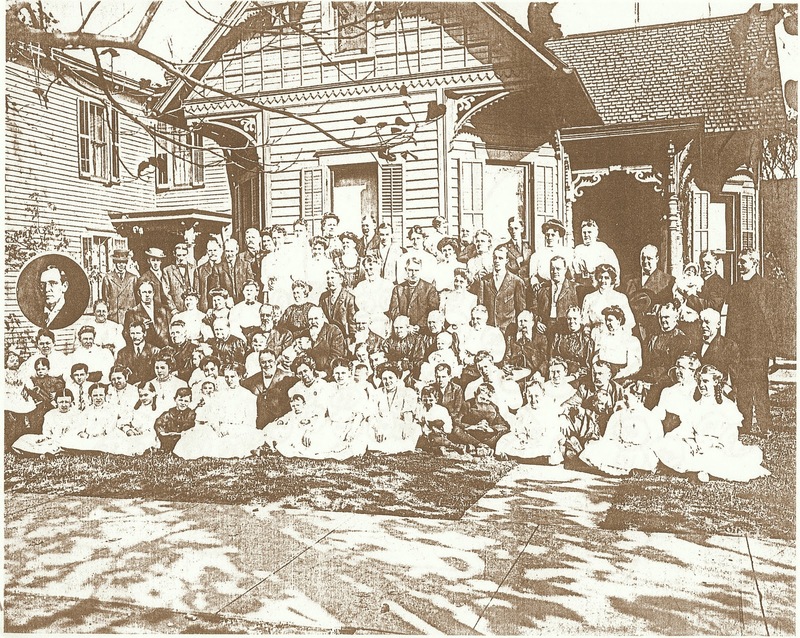 On October 12, 1908, over 90 family members of John Frisz (1830-1913) and Magdalena Gasper (1839-1911) gathered together at their home in Terre Haute, Indiana, to celebrate their 50th wedding anniversary. John is my 4x great-uncle. His parents, my 4th-great-grandparents, were Joseph Frise (1796-1864) and Marguerite Lang (1802-1868), immigrants from Seingbouse, Moselle, France. Their oldest child, Barbara, (1822-1893) was John's older sister, and my 3rd-great-grandmother. In 1846 John and Magdalena set sail from Le Havre, France, with eight of their nine children, ages 2-24, including Barbara, 24, and John, 16, on the ship J.H.Cooper. They arrived in port at New Orleans, Louisiana on July 20, 1846 along with 209 other "huddled masses" hoping to start a new life in America. Their last name, spelled "Fries" on the ship's manifest, had several variations after they arrived. On John's tombstone his name was spelled "Frise". After their mother's funeral it is said that the boys got together and decided on one spelling - "Frisz". Its pronunciation rhymes with "grease". Barbara's younger brother John married Magdalena Gasper (1839-1911) and they settled in Jennings County near both of their families. In 1850 John was a farmer. By 1860 he was working as a blacksmith. John and Magdalena had eight children - Katherine Margaret (1859-1939), Mary Magdalene (1860-1951), John K. (1861-1897), Joseph William (1863-1939), George Bernard (1864-1947), Magdalena Virginia (1866-1942), Christopher C. (1868-1881), and Peter Paul (1881-1882). By 1870 the family had moved to Bowling Green, Kentucky, where John was working as an "Ale Dealer". He continued this trade for several years. By 1890 he and "Maggie" had moved to Terre Haute, Indiana, where John was working as a house carpenter. Many of their children and their own families followed their parents to Terre Haute. It was here that everyone gathered together on that sunny day in October to celebrate the 50th anniversary of John and Magdalena. Along with the group picture taken on the front lawn of the house, several photographs were taken including one of the four surviving children of Joseph and Marguerite - John, now 77, Anne, 75, Peter, 70, and Joseph, 65. My great-great-great-grandmother Barbara Brunett had died in 1893; her husband John had died years earlier, in 1863. None of her children were in attendance. My great-grandfather John Martin O'Donnell, attended Eminence College in Henry County, Kentucky. Martin was born in Jericho, Kentucky, a small town also in Henry County, on November 7, 1865. 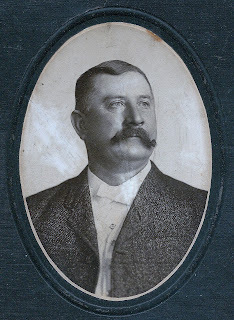 His parents were immigrants from Ireland - Patrick O'Donnell (1823-1911) and Bridget Kennedy (1838-1883). Martin was the youngest child of seven, and their only son. 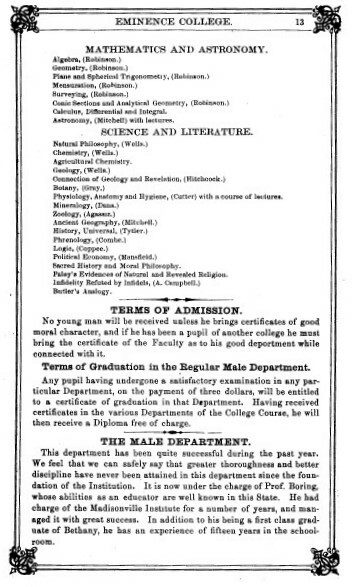 From 1881 to 1885 Martin attended Eminence College. On June 3, 1885, "Having Completed the Required Course of Study of this College and Commended Himself to Us by his Excellent Deportment and his Literary and Scientific Attainments" the faculty and trustees presented "John O'Donnell" a Bachelor of Science Degree. You might say that if he hadn't earned his degrees from Eminence College he wouldn't have had the education needed for his job as a civil engineer with the L&N Railroad. And without the job, he would have had no reason to leave his father and sisters and move to Birmingham - he wouldn't have met his wife, they wouldn't have had their children, and I would not be here typing on my laptop to share this information with my family. 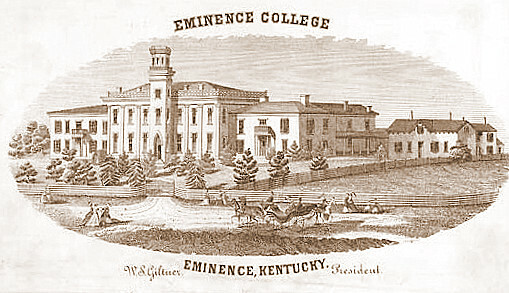 "Eminence College was located in Eminence, Henry County, Kentucky and began as a high school. In 1855 the citizens of Eminence organized a stock company to raise funds to build the high school, which opened in September 1857. The school soon became overextended, and in 1858 the facilities were sold to another stock company headed by the Rev. W.S. Giltner, a member of the Christian Church. As the major stockholder, Giltner became president of Eminence College. 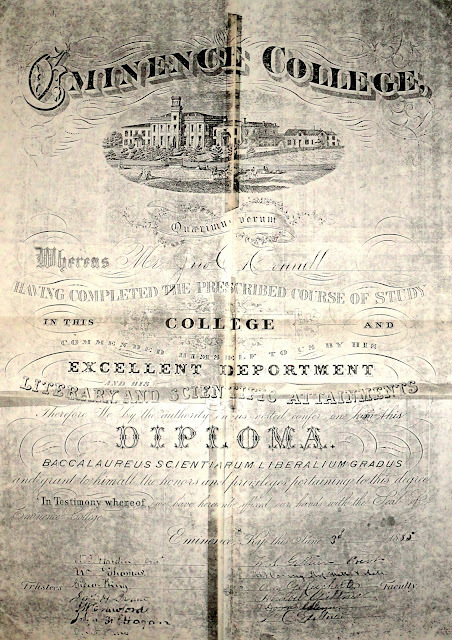 The college was one of the first coeducational schools in the state. 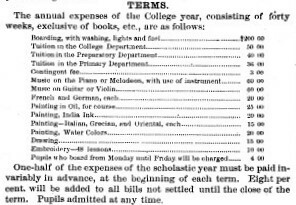 Programs were offered in Latin, Greek, mathematics, chemistry, and physics. "As fine apparel fosters pride and engenders envy we earnestly request parents to provide for their children only plain substantial clothing. As the health cannot be too carefully guarded, thick shoes and woolen stockings must be furnished for winter. Boarders must not borrow or lend wearing apparel." "We earnestly request parents or guardians not to furnish their children or wards with 'pocket money'. It engenders prodigality, and affords them the means of contracting vicious habits." "No young lady will be allowed to make any purchases without permission from the President." "All correspondence and letters will pass through the hands of the President. Boarders will not be allowed to correspond with anyone except members of their own family. Any pupil guilty of conducting a clandestine correspondence, or aiding another in it, will be promptly dismissed from the school." "As visiting interferes with study, distracts attention, and weakens discipline, none will be allowed unless expressly requested by parents or guardians." "By this it is not meant that boys and girls form one department; on the contrary each department is distinct, and will remain so. Yet the entire school is brought together in the Chapel every morning for the purpose of prayer, the reading of a chapter in the Bible, and for such remarks as the President of the Institution may think proper to make on Biblical history, general literature, or any subject connected with the intellectual or moral improvements of the pupils. 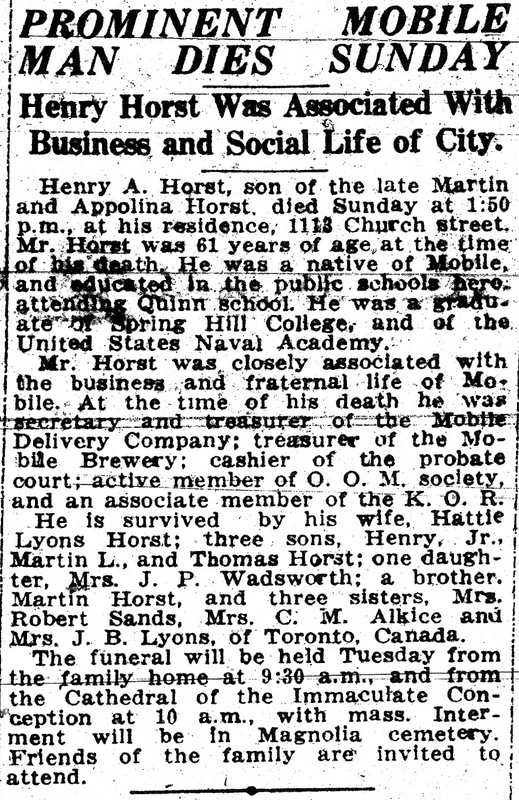 Henry August Horst was born in Mobile, Alabama on January 28, 1861. He is my great-great-great-uncle. His parents were Martin Horst (1830-1878) and Apollonia Weinschenk (1829-1908), my 3x-great-grandparents. He was their third son of six (only four survived to adulthood); Henry also had two younger sisters. His oldest brother, Charles Frederick (1856-1912), is my great-great-grandfather. Henry was the only son in his family to attend the United States Naval Academy in Annapolis, Maryland. (His brothers attended Spring Hill College in Mobile, a Catholic men's school.) 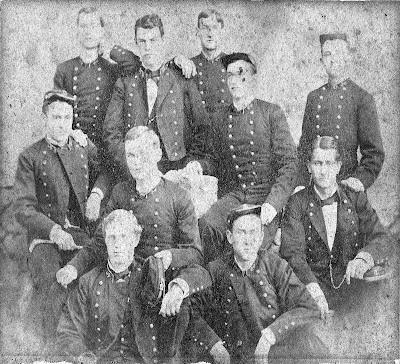 He graduated from the Naval Academy in 1882 and stayed in the Navy until 1884. "When the founders of the United States Naval Academy were looking for a suitable location, it was reported that the Secretary of the Navy George Bancroft decided to move the naval school to 'the healthy and secluded' location of Annapolis in order to rescue midshipmen from 'the temptations and distractions that necessarily connect with a large and populous city'. 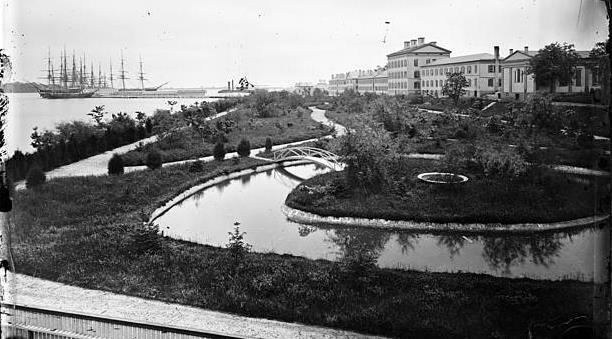 The Philadelphia Naval Asylum School was its predecessor. After leaving the Navy Henry returned to his hometown. On July 13, 1887, Henry married Harriett "Hattie" Clitherall Hall (1866-1893), the daughter of a prominent Mobile physician. Henry and Hattie lived in her family's home at 110 St. Emmanuel Street, a house that had been passed down from her maternal grandfather. At this time Henry worked as a bookkeeper at Eichold Bros. & Weiss, a liquor distributor much like his father had been. 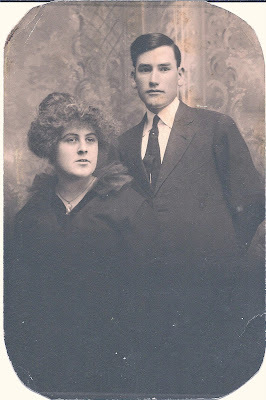 Henry and Hattie soon had two children, Henry Alexander, born May 23, 1888, and Harriett "Hattie" Mae, born May 13, 1890. Tragedy struck the family when Henry's wife died on February 3, 1893. She was just 26; her children were 4 and 2. On June 10, 1896, Henry married Behethelen "Hetty" Gaines Lyon (1872-1923). Henry and Hetty soon started their own family - Martin Lyon, born June 25, 1897; Mary Lyon, born August 31, 1898; Thomas Temple Armstrong, born October 27, 1900; and Windham Lyon, born January 12, 1903. Their daughter Mary died at the age of 3 on Christmas Eve, 1901. Youngest child Windham died the day after his 16th birthday; his cause of death was listed as "epilepsy". Just three years later Henry, too, died, from stomach cancer on March 12, 1922. He was 61. One year later Hetty passed away, on July 26, 1923. Her cause of death was listed as "acute indigestion". She was only 50 years old. They are all buried at Magnolia Cemetery. Henry's descendants are numerous, most still living in Mobile. One great-grandson said that his grandfather Martin gave Henry's class ring to the Naval Academy back in the 60's when he was up visiting relatives. 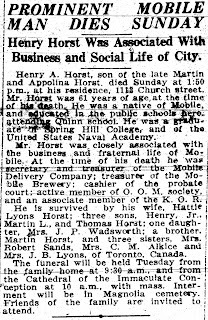 Interestingly I have a cousin, also descended from Charles F. Horst, Henry's older brother, who attended and graduated from the Naval Academy in 1979, almost one hundred years after our great-great-great uncle Henry. 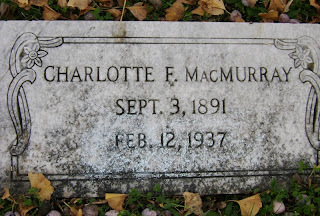 Charlotte Teresa Flemming was the seventh child of ten born to my great-great grandparents, Charles Clinton "Charlie" Flemming (1854-1932) and Elizabeth Agnes "Lizzie" McCaffrey (1858-1822). Lottie, as she was called, was born in Birmingham, Alabama, on September 3, 1891. Lottie had three older brothers - Harry Clinton (born 1878), my great-grandfather; Charles Clinton (born 1884); and James Benjamin (born 1889). She also had three older sisters - Susie Elizabeth (born 1879); Minnie Agnes "Mamie" (born 1880 - she died at 14 months old, before Lottie was born); and Elizabeth Imogene "Imo" (born 1886). She had one more younger brother, Thomas Joseph (born 1896). She also had two younger sisters - Sarah Marie (born 1893) and Willie Mae (born 1898). Willie Mae lived less than 6 months. Lottie is my great-great-aunt. On April 14, 1908, Lottie, just 16 years old, married Thaddeus Linwood Lamas, a 21-years old railroad clerk, in a ceremony in Tuscaloosa, Alabama. Why did they marry in Tuscaloosa instead of at her hometown of Birmingham? Was he a student at the University of Alabama? I don't know those answers yet. At some point soon after they were married they moved to Mexico - they returned on the ship S.S. Norheim, sailing out of Vera Cruz on December 14, 1909. According to the ship's manifest he was 5-foot-2-inches tall with a dark complexion, black hair and brown eyes; she was 5-foot-5-inches, light complexion, light hair and gray eyes. They sailed into New Orleans where they set up their home together. Linwood was now working as a traveling salesman. In early November 1918, while they were living in Anniston, Alabama, Linwood was one of thousands of Alabamians to catch the Spanish Flu during the 1918 Pandemic. On the the 5th of the month he succumbed to pneumonia, dying as most young people who got the flu did. He was just 32 years old. Lottie was now a widow at the age of 27. Lottie was a widow for only two and a half years, until she met and married William Edward McMurray (1893-1997). 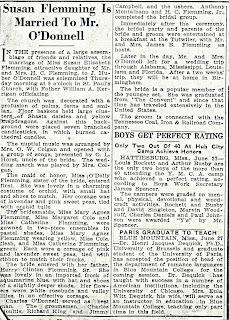 This marriage also occurred out of town, in Anniston,on April 19, 1921; he was 28 and she was 29. Willie, a fireman in Birmingham, had been married before and he too had lost his spouse young. By the time of the 1930 U.S. Census, Lottie and Willie were back living in Birmingham where he was working as a "fire alarm operator". In February 1937, Lottie boarded a train out of Birmingham going to New Orleans. She was alone. Her brother Harry was a train engineer that took the train to Meridian, Mississippi, on its way to New Orleans - maybe she rode along with him. When she arrived on Thursday, February 11, she checked into a rooming house at 2014 Canal Street and registered under the name "Mrs. N.A. Williams" of Atlanta, Georgia. The following morning Lottie got up and put on a dark green dress, a black coat with a fur collar, fabric slippers and brown stockings before walking out to Lake Pontchartrain, near Canal Boulevard. A watchman with the WPA watched her walking along the sea wall before having a seat on the steps. "The body of an unidentified woman, apparently between 40 and 45 years old, was found in Lake Pontchartrain early Friday afternoon near the edge of Canal Boulevard sometime after a WPA watchman is reported to have seen her seat herself on the sea wall steps. The woman was described by the attaches at the city morgue, where the body was taken, as having weighed about 175 pounds with light brown hair and false teeth. In the left side of the lower dental plate she had a gold tooth. She wore a dark green dress, black coat with fur collar, fabric slippers and brown stockings. William Darsam, 800 Frenchmen street, WPA watchman, said that he saw the woman, at about 11:40 a. m., walk along the sea wall and then seat herself on the steps. An hour later he said he was called by Joseph Intravia, 4521 Drayades street, a motorist, who had seen the body floating in the lake. Darsam telephoned the 10th Precinct station and, upon returning to the scene, found that Leon LeFebvre, 1723 Andry street, a WPA chauffeur, had waded into the water and removed the body to the sea wall. "The body of a woman found floating in Lake Pontchartrain near the sea wall at Canal Boulevard Friday afternoon was identified in the city morgue Saturday morning as that of a Mrs. N. A. Williams, Atlanta, Gal, who registered at a Canal street rooming house on last Thursday. Carrie RuffinWhalen, where she identified the body. Detectives found a suitcase in the room, but all marks of identification had been removed from the wearing apparel. A piece of ribbon was found with a laundry mark of "Lottye McMurray." Police asked Atlanta authorities to attempt to find relatives of the woman. The woman, who was about 42 years old, was seen sitting on the steps of the sea wall by William Darsam 800 Frenchmen street, a watchman, at 11:45 a. m. Friday, an hour before the body was found by Joseph Intravia, 4521 Dryades street. Leon LeFebvre, 1723 Audry street, a chauffeur, recovered the body. "The body of a woman found in Lake Pontchartrain near Canal Boulevard Friday was claimed at the parish morgue Sunday afternoon by the undertaking firm of Tharp-Sontheimer-Tharp, Incl, 4117 South Claiborn avenue, who told coroner's attaches they were acting on instructions from a Birmingham, Ala., undertaker. The chief clerk's office at police headquarters was told over long-distance telephone Sunday by a man who gave the name of N. C. Fleming (sic) that he and a man whom he identified as McMurray will arrive today at 7 a. m. from Birmingham to determine whether the woman was McMurray's sister, Miss Lottye McMurray. Detectives reported Saturday that the woman registered Thursday at a rooming house at 2014 Canal street as "Mrs. N. A. Williams of Atlanta, Gal". In a suitcase in the room they found a ribbon with the laundry mark "Lottye McMurray". 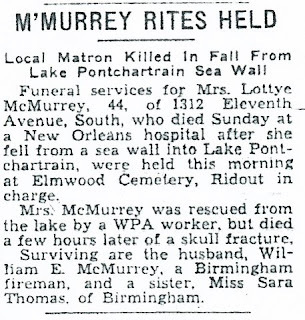 The Birmingham News announced the death of Lottie McMurray on February 17, 1937. "Funeral services for Mrs. Lottye McMurrey, 44, of 1312 Eleventh Avenue, South, who died Sunday at a New Orleans hospital after she fell from a sea wall into Lake Pontchartrain were held this morning at Elmwood Cemetery. Ridout in charge. 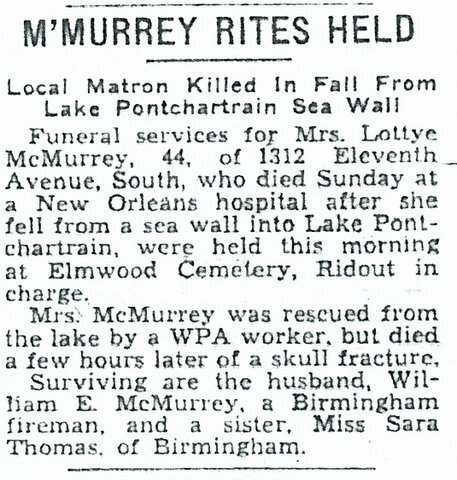 Mrs. McMurrey was rescued from the lake by a WPA worker but died a few hours later of a skull fracture. June 19, 1898 - Her little sister Willie Mae, 5 months old; Lottie was 6 years old. November 24, 1908 - Her older sister Susie, 29 years old, from childbirth; Lottie was 17. November 5, 1918 - Her husband Linwood, 32 years old from Spanish flu during Pandemic; Lottie was 27. July 17, 1922 - Her mother Lizzie Flemming, 63; Lottie was 30. 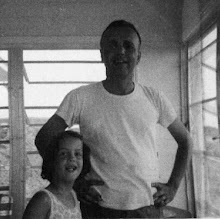 January 26, 1932 - Her father Charlie Flemming, 77; Lottie was 40. May 30, 1935 - Her older brother Charles, 50, from burst appendix; Lottie was 44. Only her brother Harry, who died in 1955 at age 77, and her sister Sarah, who died in 1963 at age 69, had survived her. She had lost 7 siblings, her parents and her first husband by the time she turned 45. Her husband Willie, remarried a year after Lottie's death and died at age 94 and 1987. 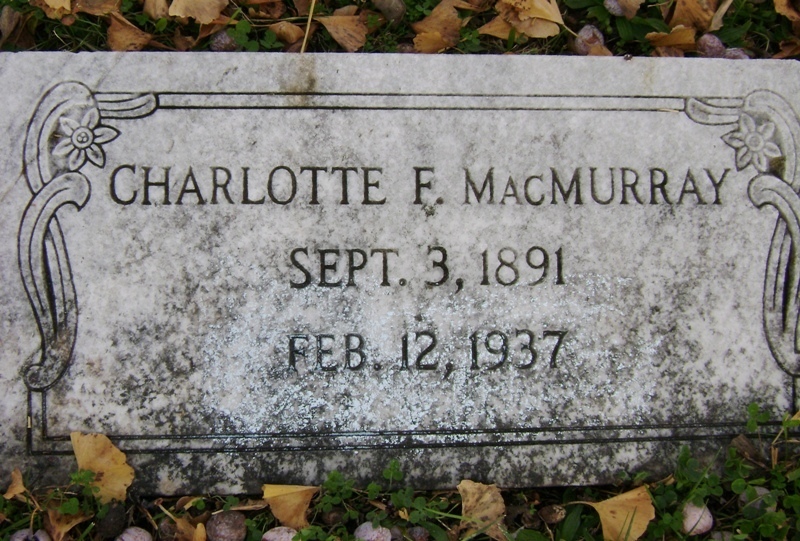 Lottie is buried in the Flemming Family lot at Elmwood Cemetery in Birmingham. 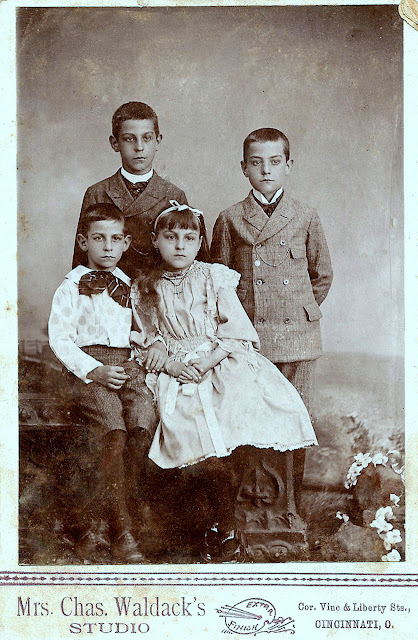 These are the children of Charles Frederick Horst (1856-1912) and Odalie Felice Fortier (1857-1920), the oldest four of their five children. Charles, born in Mobile, Alabama, and Odalie, born in New Orleans, Louisiana, were married on January 10, 1879 at St. Joseph's Catholic Church in Mobile. They are my great-great-grandparents. Oldest son Charles Frederick was born November 15, 1880 in Mobile. Charles is my great-great-grandfather. Their next child, Edward Martin, was born on May 5, 1882. By 1884 Charles, Odalie and their two young sons had moved to Cincinnati, Ohio, reportedly to help Charles' health. They lived for a time with the family of his father's sister Elizabeth Horst Ginter (1827-1877). Charles continued working as a bartender in Cincinnati, a job he had learned from his father Martin Horst (1830-1878) and practiced in the family's saloon in Mobile. On November 19, 1884, daughter Pearl Alphonsine was born in their new home in Cincinnati. Pearl is my great-grandmother [she married Harry Clinton Flemming (1878-1955)]. On January 11, 1885 Pearl was baptized at St. Peter in Chains Catholic Church. On May 5, 1887, Omer Leo , the couple's fourth child was born. This picture appears to have been taken of the four siblings about 1892, while still living in Ohio. It wasn't long after this was taken that the family of six moved one last time to Birmingham, Alabama - a young city, founded in 1871. Soon Charles' younger brother Edward (1858-1901) had also moved from Mobile to Birmingham and together they bought and ran a saloon of their own, the Palace Royale. It was here that the last child was born. Odalie Felice, called Dolly, was born on January 20, 1896. The children in the photograph all look so unhappy here, like their mother must have just scolded them. A little online research by me in writing this post (including an article in Mental Floss http://www.mentalfloss.com/blogs/archives/6822) gives a couple of reasons for this. The "commonly held" belief is that in early photography it took so long for an image to be exposed and it holding a smile was too hard to do. This theory is debunked - by the mid-1840's long exposures were no longer necessary so this wouldn't explain it. The most likely reason given is that people weren't used to having their pictures taken and, along with the expense, having one's picture taken was a serious event. Until photography existed pictures were painted, and portraits were created to be handed down through generations. The rich, the famous, important leaders and brilliant minds all had their portraits done and in none of them did the subjects smile. It would not have been a natural pose to sit smiling in such a posed shot. How serious would their portraits be taken if they had silly, goofy grins on them? This kind of stoic facial expression was what people of the times had grown up seeing; being happy all the time was not held in the highest of priorities as it is today. Smiling in photographs seemed to happen only after photography became more used by the mainstream public, after the mid-1910's. Jacques Omer Fortier (1759-1820) was the fifth child, and second son, of Michel Fortier (1725-1785) and Perinne Langlois (1734-1804), my 6th great-grandparents. Michel Fortier had been the Royal Armourer under King Louis XV, after arriving in Louisiana from France in 1840. Jacques was born in New Orleans on March 14, 1859. His godfather at his baptism at New Orleans' St. Louis Cathedral was Jacques Toutant Beauregard (1722-1782), great-grandfather of infamous Confederate General Pierre Gustave Toutant Beauregard (1818-1893). Jacques Fortier is my 5th great-grandfather. Jacques had participated 1779 with Governor Bernardo de Galvez in defense of Louisiana during the American Revolution [see post "Monday's Military-Our Own Revolutionary War Heroes", July 4, 2011 for more information]. He was appointed Second Lieutenant on April 5, 1785 with the 5th Right Louisiana Militia. He married my 5th great-grandmother Aimee Marie Victoire Felicite Durel (1768-1843) on October 1, 1787. Together they had ten children, including my 4th great-grandfather Jacques Omer Fortier (1792-1823). In addition to serving with the volunteer militia, Jacques owned Pasture Plantation, a sugar cane plantation, below Belle Grove in "Cannes Brules", in what is now Kenner, Louisiana. By 1803-05, Jacques had risen to the rank of Colonel in the Louisiana Militia. He would play a significant role in the largest slave uprising in American history, until recently largely unknown. This year, on January 9-11, 2011, marked the 200th Anniversary of the 1811 German Coast Slave Uprising. Along with local exhibits, guest lectures and a wide variety of special events commemorating the event, American Uprising: The Untold Story of America's Largest Slave Revolt was released. Written by Daniel Rasmussen, it tells the story of three days in New Orleans' history, what led up to it and what the consequences were for the men who fought for their freedom. There are now websites dedicated to the event (www.1811SlaveRevolt.com and www.theslaverebellion.org) and blogs discussing it. National Public Radio tells the story - go to www.npr.org/2011/01/16/132839717/american-rising-when-slaves-took-on-new-orleans to listen to it - as does Wikipedia - www.en.wikipedia.org/1811_German_Coast_Uprising. My story is taken from the Genealogy Trails History Group website, www.genealogytrails.com/lou/orleans/slave_revolt.html. "It began January 8, 1811, on a plantation owned by Manuel Andry in St. Charles Parish, thirty-six miles south of New Orleans (near the present-day town of Norco). Charles Deslondes, a refugee from St. Domingue who worked as a slave driver on the plantation, organized the other slaves on the plantation. With the support of runaway slaves, or "maroons," who lived in the nearby swamps, Deslondes' band wounded Andry and killed his son. 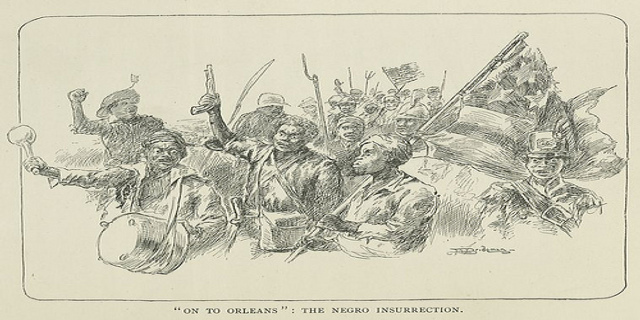 Of the seventy-five slaves who were held, twenty-five were tried at Noel Destrehan's plantation. On January 15, 1811, after one day of investigation, the tribunal condemned eighteen of the slaves. They were taken to the plantations of their respective masters, where they were shot and their heads cut off and mounted on poles as an example to the remaining slaves. March 6, 1811- Col. J. Fortier, in his private name, and in that of all the inhabitants of the upper coast, begs leave to address to General Hampton, and the offers and troops under his command, as well as to the detachment of the corps of marine, the sincerest expressions of thankfulness, for the zeal and promptitude with which they have been protected. The respect for the persons and property and strict discipline of the troops, deserved the greatest encomium. The body of volunteers are also requested to make a merited share of praise for their courage and patience, in suffering privations and unavoidable fatigues on such occasions; and although the invaluable service which they have rendered to the county can be feebly expressed, it will ever be engraved in the hearts of all the inhabitants, and peculiarly in that of col. J. Fortiers." Charles Clinton Flemming (1854-1932) started Charlie's Transfer Company in Birmingham, Alabama, in 1902. Charlie, as he was called, is my great-great-grandfather. Charlie was born in Darlington, South Carolina, the oldest son of James Benjamin Flemming (1827-1907) and Sarah Linza Jackson (1837-1902), my great-great-great-grandparents. 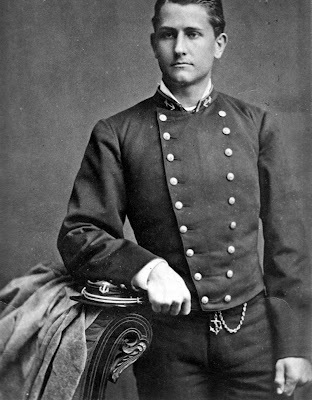 He moved with his parents first to Cassville, Georgia, before the Civil War, then to Rome, Georgia, when Cassville was burned down. Here he met and married Elizabeth Agnes "Lizzie" McCaffrey (1858-1922). They had ten children, eight surviving to adulthood. Their oldest child was my great-grandfather, Harry Clinton Flemming (1878-1955). By 1888 Charlie had moved to Birmingham with the Alabama Great Southern Railroad. He worked primarily as general yardmaster at the freight depot, located on Morris Avenue between 16th and 17th streets. [The yardmaster would oversee switching and yard operations where trains are "made up" or prepared for their next service and schedule maintenance of trains.] He was a large man, 6'6" and 300 pounds. 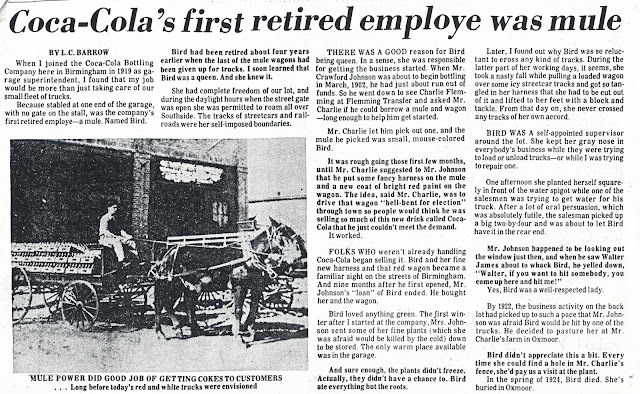 In 1902 he retired from the railroad and started Charlie's Transfer Company. Charlie's Transfer was located at 2111-2113 Fifth Avenue South on Birmingham's Southside, next door to the Coca-Cola company. It was known to the Flemming family as "the stables" since it began as a horse and wagon outfit, later switching to trucks. The business apparently flourished. The company were movers of furniture, machinery, safes; provided general storage; and were general distributors and handled bonded goods. Over the years many family members earned their living here. Oldest son Harry, while employed as an Engineer with the Alabama Great Southern RR, also kept the books for the transfer company, becoming Vice President at one time. Charles Clinton, Jr. (1884-1935) started in the family business as a Clerk, later became Treasurer for a number of years and was made President when his father retired. Son James Benjamin (1889-1932) became a Collector for the company and held various positions, including Clerk and Foreman, eventually serving as Secretary-Treasurer and Vice President. Son Thomas Joseph (1896-1918) was Bookkeeper before his death at age 22 from the Spanish Flu (at the height of the 1918 Pandemic). "When I joined the Coca-Cola Bottling Company here in Birmingham in 1919 as garage superintendent, I found that my job would be more than just taking care of our small fleet of trucks. Because stabled at one end of the garage, with no gate on the stall, was the company's first retired employe - a mule. Named Bird. Bird had been retired about four years earlier when the last of the mule wagons had been given up for trucks. I soon learned that Bird was a queen. And she knew it. She had complete freedom of our lot, and during the daylight hours when the street gate was open she was permitted to roam all over Southside. The tracks of streetcars and railroads were her self-imposed boundaries. There was a good reason for Bird being queen. In a sense, she was responsible for getting the business started. When Mr. Crawford Johnson was about to begin bottling in March, 1902, he had just about run out of funds. So he went down to see Charlie Flemming at Flemming Transfer and asked Mr. Charlie if he could borrow a mule and wagon - long enough to help him get started. Mr. Charlie let him pick out one, and mule he picked was small, mouse-colored Bird. It was rough going those first few months, until Mr. Charlie suggested to Mr. Johnson that he put some fancy harness on the mule and a new coat of bright red paint on the wagon. The idea, said Mr. Charlie, was to drive that wagon "hell-bent for election" through town so people would think he was selling so much of this new drink called Coca-Cola that he just couldn't meet the demand. Folks who weren't already handing Coca-Cola began selling it. Bird and her fine new harness and that red wagon became a familiar sight on the streets of Birmingham. And nine months after he first opened, Mr. Johnson's "loan" of Bird ended. He bought her and the wagon. Bird loved anything green. The first winter after I started at the company. Mrs. Johnson sent some of her fine plants (which she was afraid would be killed by the cold" down to be stored. The only warm place available was in the garage. And sure enough, the plants didn't freeze. Actually, they didn't have a chance to. Bird ate everything but the roots. Later, I found out why Bird was so reluctant to cross any kind of tracks. During the latter part of her working days, it seems, she took a nasty fall while pulling a loaded wagon over some icy streetcar tracks and got so tangled in her harness that she had to be cut out of it and lifted to her feet with a block and tackle. From that day on, she never crossed any tracks of her own accord. Bird was a self-appointed supervisor around the lot. She kept her gray nose in everybody's business while they were trying to load or unload trucks - or while I was trying to repair one. One afternoon she planted herself squarely in front of the water spigot while one of the salesmen was trying to get water for his truck. After a lot of oral persuasion, which was absolutely futile, the salesman picked up a big two-by-four and was about to let Bird have it in the rear end. Mr. Johnson happened to be looking out the window just then, and when he was Walter James about to whack Bird, he yelled down, "Walter, if you want to hit somebody, you come up here and hit me!" Yes, Bird was a well-respected lady. By 1922, the business activity on the back lot had picked up to such a pace that Mr. Johnson was afraid Bird would be hit by one of the trucks. He decided to pasture her at Mr. Charlie's farm in Oxmoor. Bird didn't appreciate this a bit. Every time she could find a hole in Mr. Charlie's fence, she'd pay us a visit at the plant. An interesting tidbit I discovered when writing this - "Charlie's Transfer Company" was a plaintiff in three separate lawsuits that were eventually settled in the Alabama Supreme Court. The first, "Charlie's Transfer Co. vs Leedy & Co.", decided December 13, 1916, involved the company being sued for injury resulting in one of its trucks striking a horse and buggy. 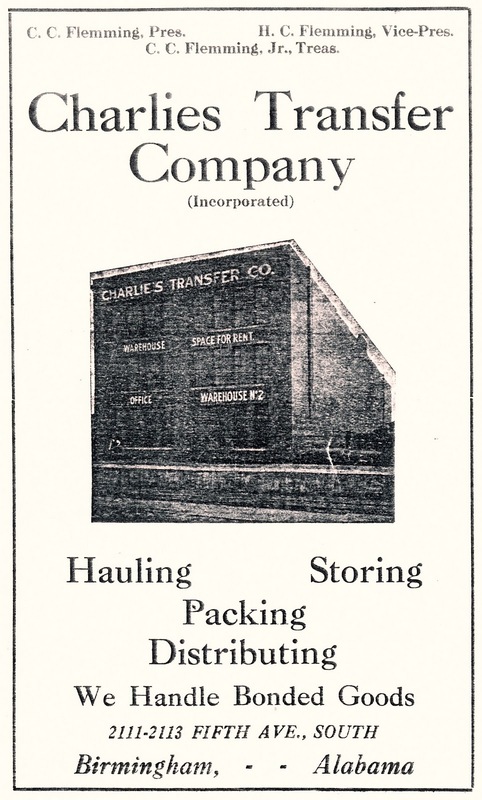 The second, "Charlie's Transfer Co. vs Malone", decided February 3, 1909, involved the transfer company's earlier suing of its landlord after pipes burst in the property they had rented, damaging the goods stored in the warehouse. The final case, "Fleming (sic) vs Fowlkes & Myatt Co.", decided May 20, 1920, involved a judgement again Charles Flemming in 1903 by another business, which had never been paid. In 1916 another suit was filed on behalf of the first corporation - the Fox Sons Smith Company - to recover the earlier unpaid claim. The suit alleged the transfer of ownership to Charlie's wife Lizzie on the same date in 1903 that the judgement was made which made it impossible to recover any money since Charlie now had no money of his own. Very interesting don't you think? On Thursday morning, June 27, 1929, John Huber O'Donnell (1905-1964) and Susan Elizabeth Flemming (1909-1999) were married at St. Paul's Church in Birmingham, Alabama. He was 25 at the time; she was 19. Huber and Susie are my grandparents. 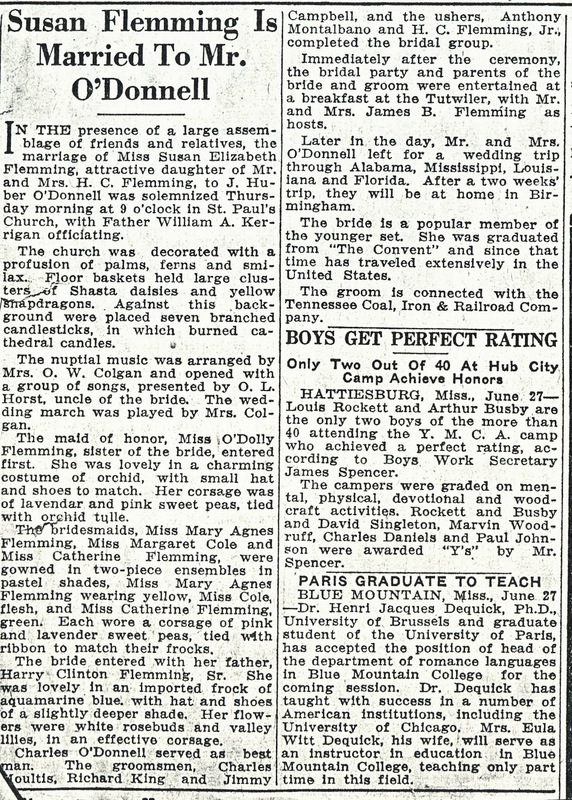 The Birmingham Age-Herald announced their wedding the following day. "In the Presence of a large assemblage of friends and relatives, the marriage of Miss Susan Elizabeth Flemming, attractive daughter of Mr. and Mrs. H.C. Flemming, to J. Huber O'Donnell was solemnized Thursday morning at 9 o'clock in St. Paul's Church, with Father William A. Kerrigan officiating. The church was decorated with a profusion of palms, ferns and smilax. Floor baskets held large clusters of Shasta daisies and yellow snapdragons. Against this background were placed seven branched candlesticks, in which burned cathedral candles. The nuptial music was arranged by Mrs. O.W. Colgan and opened with a group of songs, presented by O.L. Horst, uncle of the bride. The wedding march was played by Mrs. Colgan. The maid of honor, Miss O'Dolly (sic) Flemming, sister of the bride, entered first. She was lovely in a charming costume of orchid, with small hat and shoes to match. Her corsage was of lavender and pink sweet peas, tied with orchid tulle. The bridesmaids, Miss Mary Agnes Flemming, Miss Margaret Cole and Miss Catherine Flemming, were gowned in two-piece ensembles in pastel shades. Miss Mary Agnes Flemming wearing yellow, Miss Cole, flesh, and Miss Catherine Flemming, green. Each wore a corsage of pink and lavender sweet peas, tied with ribbon to match their frocks. The bride entered with her father Harry Clinton Flemming, Sr. She was lovely in an imported frock of aquamarine blue, with hat and shoes of a slightly deeper shade. Her flowers were white rosebuds and valley lilies in an effective corsage. Charles O'Donnell served as best man. The groomsmen, Charles Moultis, Richard King and Jimmy Campbell, and the ushers, Anthony Montalbano and H.C. Flemming, Jr., completed the bridal group. Immediately after this ceremony, the bridal party and parents of the bride and groom were entertained at a breakfast at the Tutwiler, with Mr. and Mrs. James B. Flemming as hosts. Later in the day, Mr. and Mrs. O'Donnell left for a wedding trip through Alabama, Mississippi, Louisiana and Florida. After a two weeks' trip they will be at home in Birmingham. The bride is a popular member of the younger set. She was graduated from "The Convent" and since that time has traveled extensively in the United States. The groom is connected with the Tennessee Coal, Iron & Railroad Company. " 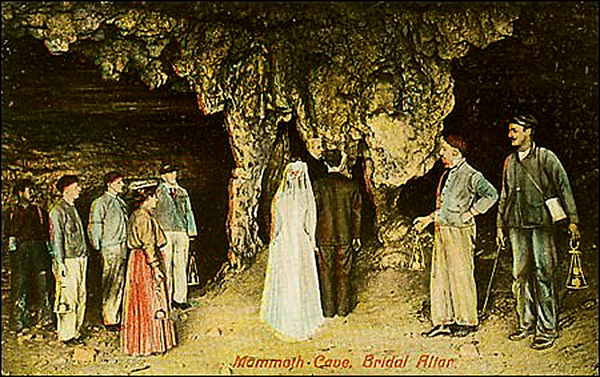 On their honeymoon they also visited Mammoth Cave, located north of Bowling Green, Kentucky. The photograph above was taken of their group waiting for their tour to begin. Mammoth Cave is the world's longest cave, with over 390 miles explored. It has long been a popular tourist location and was a frequent honeymoon destination in the mid- to late- 1800's and the early 1900's. It was given the name "Mammoth" because of its enormous size - even before they knew exactly how big it really was. 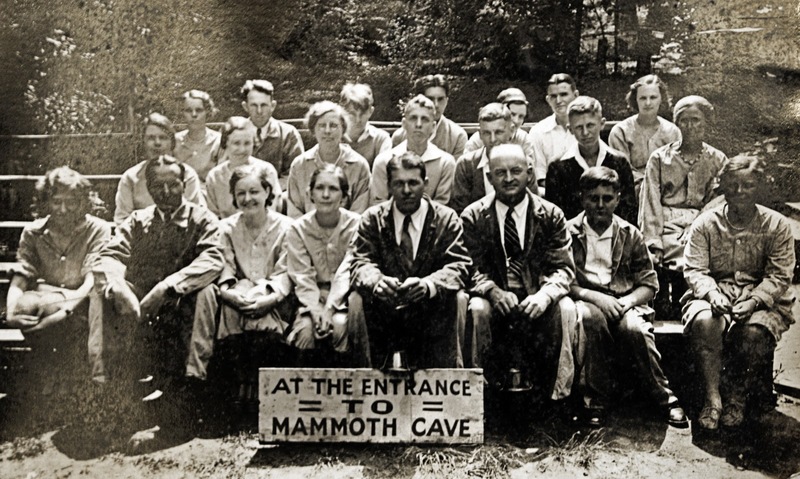 The cave became a part of the National Park Service in 1941 and a World Heritage Site in 1981. The history of Mammoth Cave and human inhabitants span 6,000 years; remains of Native Americans buried intentionally and those who died in the cave have helped to date the first visitors. Legend has it that the first European to visit the cave was in 1797. The cave's saltpeter reserves became important during the War of 1812 with the British blockade of the United States' ports. 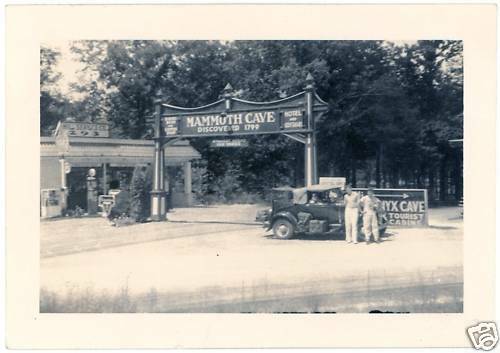 The cave's ownership changed hands during this time and soon it was being mined for calcium nitrate. 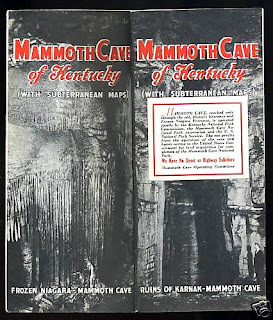 In 1839 a Louisville physician bought the cave to use as a tuberculosis hospital because of its constant air temperatures and its natural preservative qualities. Unfortunately this experiment was a failure and the doctor too would eventually die from this widespread and incurable disease. Throughout the 19th century the cave earned national and international renown. 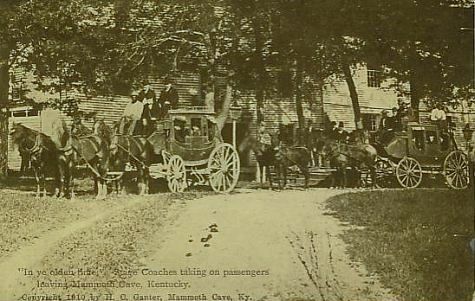 With the opening in 1859 of the Louisville and Nashville Railroad, tourists could be transported from the railroad stop, by stagecoach to the cave entrance. By 1886 the Mammoth Cave Railroad would provide service for the tens of thousands of tourists each year who came to see the cave. In 1906 tourists were also brought to the cave by steamboat after the construction of a lock and dam of the Green River in Brownsville. In the early 1920's new entrances were blasted open, creating new competition for the owners. Weddings were regularly held at the cave's "Bridal Altar", a natural formation of three stalactites, symbolizing the bride, the groom and the clergyman. 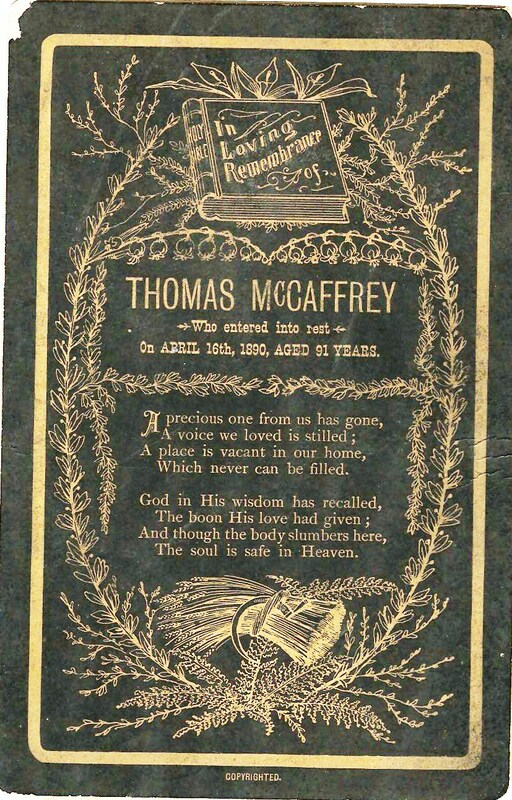 Thomas McCaffrey was born in 1799 in County Tyrone in Ireland. In 1825 he boarded the ship Carolina Ann out of Belfast, along with 129 other Irish citizens headed for America. They arrived in New York harbour on June 20, 1825. His occupation was listed as "weaver". No other family had made the trip with him. Thomas McCaffrey is my 4th great-Grandfather. He married Susan (1793-1869), also an immigrant from County Tyrone, presumably soon after arriving. Her maiden name is unknown, as is the date of their marriage. It is possible that Thomas met his wife on the ship coming over - there is only one "Susan" of the 130 passengers listed, and she lists her age as 30, make her born in 1795. [Thomas listed his age as 28 when he was really 26 - maybe they were both fudging their ages, which seemed to be quite common even in those days!] Children soon entered their lives when the first two children were Mary, born in 1826, and James, born in May 1830. Their third child was Thomas Joseph, my third-great-grandfather. He was born in Boston, Massachusetts on April 17, 1832. Two more daughters followed - Susan, born in 1834, and Elizabeth, born in 1837. Their youngest child was called 'Eliza'. All were born in Massachusetts. By 1850, the family had celebrated the marriage, then suffered the death of their oldest daughter, Mary, who died at the age of 20. The family was now living in Baltimore, Maryland. Thomas listed his occupation in the 1850 U.S. Census as "ash collector." [Presumably the ash collector's job was going door to door removing the ashes from fireplaces of homes and businesses. Son James, 20, was listed as a carpenter; Thomas, 18, was a pattern maker. In 1853, son Thomas married my third-great-grandmother Charlotte McCluskey (1838-1917) and children soon followed. On October 4, 1855, Thomas' sister and his parents' 21-year-old daughter Susan died. Son Thomas moved to Alabama to support the Confederacy at the beginning of the war; his wife and children would soon follow. All was not lost for Thomas and Susan. Son James married Margaret (1845-UNK) and by 1864 had given his parents a grandson. In 1866 their only surviving daughter, Eliza, married Thomas James Rice (1864-UNK) and they would have four sons. On Christmas Eve, December 24, 1869, Thomas' wife Susan died. According to the newspaper she was 58 (or 68). Her headstone listed her age as 76. Thomas, himself seventy-one at the time, moved into the home of his son-in-law at 408 South Central Avenue in Baltimore. He had listed his occupation in the 1870 Census as "carter". [A carter is one who drives carts or one who carries goods in a cart.] By the time of the 1880 Census he no longer listed an occupation - he was 81 at the time. In 1874 son James, at 44, died after a "short and painful illness", according to The Baltimore Sun's notice of his death. Thomas had now survived the loss of three of his children and his wife, as well as four of his grandchildren. On April 16, 1890, Thomas died at the age of 91. He was buried next to his wife and children at St. Patrick's Cemetery in Baltimore. He was survived by son Thomas, daughter Eliza, fourteen grandchildren, including my great-great-grandmother Elizabeth McCaffrey Flemming (1858-1922) and ten great-grandchildren, including my great-grandfather Harry Clinton Flemming (1878-1955). 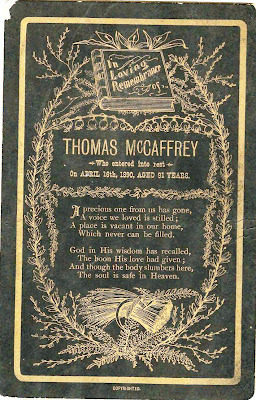 "McCAFFREY - On the evening of April 16, 1890, at the residence of his son-in-law, Thomas Rice, No. 408 South Central avenue, Thomas McCaffrey aged 91 years, a native of county Tyrone, Ireland. May he rest in peace. A Requiem Mass was held for him on April 19th at St. Patrick's Catholic Church. This prayer card was one given out at the Mass. On APRIL 16th, 1890, AGED 91 YEARS. Odalie Fortier is the name of my great-great-Grandmother - Odalie Felice. She was born in New Orleans, Louisiana on August 31, 1857, the seventh child of eleven born to my 3x-grandparents Jacques Omer Fortier (1813-1857) and Augustine Melanie Laperle DeGruy (1822-1872). Odalie married Charles Frederick Horst (1856-1912) and together they had five children, including my great-Grandmother Pearl Alphonsine Horst Flemming (1884-1961). But my great-great-Grandmother Odalie was not the first Odalie born to her parents! The first Odalie Fortier came into the world eleven years earlier. On August 31, 1846, Laperle Fortier gave birth to her fourth child, and fourth daughter, Odalie. Omer and his wife were probably both thrilled and apprehensive at what her birth could mean. They had already had three little girls, and lost one of them. Their first child was named Adele Augustine Philomene. She was born in June 1841, thirteen months after her parents were wed. Laperle was just 19 when her first child was born; Omer was 28. Adele lived two short months, dying on August 17, 1841. Their next child was Ida, born September 13, 1842. Their third child, another daughter, was named Alice. She was born on April 6, 1844. So when their fourth daughter, Odalie, was born in 1846 her older sisters Ida, age 4, and Alice, 2, were probably thrilled to have a new little sister. But tragedy soon struck the family. On January 29, 1848, Ida, at just 5 years of age, died. Now the family once again had just two little girls, Alice, 4, and Odalie, 16 months, at home. It wasn't long before Laperle was soon expecting her next child. She no doubt could have any idea of what was about to happen in her young family. But the day, so filled with happiness, also held great sorrow. Two-and-a-half year old Odalie died, on the same day as her baby sister was born! The announcement of her death appeared on page 1 of the New Orleans Bee (L'Abeille) newspaper the following day. "DIED - Yesterday evening at six o'clock, ODALIE FORTIER, two years and a half old, daughter of Omer Fortier and Mdme. Laperle Degruys. The friends and acquaintances of the family are invited to attend without further invitation her funeral, which will take place this evening at 4 o'clock P.M. from Bayou street, between Treme and Marais." Was little Odalie sick at the time, got worse and died that day, causing her mother to go into labor? Or was Laperle in labor, with all the natural chaos that must have brought; maybe their little 2-and-a-half year old got lost in the shuffle and got into some type of danger that cost her her life? Did she drown? Get out of the house and get run over by a cart or horse? It was tragic enough that the notice of her death appeared prominently on page 1 of the next day's newspaper. None of the family's other young children's deaths were ever reported in the paper. I can't even imagine how as parents you go on after something like that. They had lost three of their four daughters by the day of their fifth child's birth. It was no doubt very difficult for Omer and Laperle, and they did not conceive another child for almost six years. Then their sixth child, and first son, Omer Auguste, was born on June 30, 1855. Two more years passed before their seventh child, my great-great-Grandmother, was born on August 31, 1857. This was the exact same birth day as their little Odalie, who had died at age 2. The day would have been her 11th birthday. So it must have been a way for her parents to honor their little girl when they named this newest baby Odalie Felice. Odalie grew up, married and moved to Birmingham with her husband Charles Horst and had 5 children. The couple passed on the name when they named their youngest child Odalie Felice Horst (1896-1990); she was called "Dolly". Dolly moved to Denver, Colorado, and married Kurt Amandus Wittges (1900-1950). They had three children and named their second child, and first daughter, Odalie Marie Wittges (1930-2005); she, too, was called "Dolly". Dolly married J. Corbett and they had eight children. Odalie and Charles' third child (my great-grandmother) Pearl and her husband Harry Clinton Flemming (1878-1955) named their third child Odalie Felice Flemming (1911-1994); she was called Dolly and "O.D." (or "Odee"). This Odalie married George Benedict Daly (1908-1967) and they had six children. They named their first child Odalie Kathleen Daly (1934-1995); she was called "Dolly". O.D. and George's fourth child, Jacqueline Rose "Jackie" Daly (1941-1995) had four children. The name was passed along again, as a middle name, when one of Jackie's granddaughter's was born in 1995. The name "Odalie" came from the family's French background, but this appears to be the Americanized spelling. It is pronounced, with no accent on any syllable, 'Ah-da-lee'. In France it is spelled most often "Odille". The name's exact origin is unclear; it is a variant of the old German "Odile" or "Odilia", meaning "fortunate or prosperous in battle" or "wealthy". In Hebrew the name is the feminine form of "Odell", and means "I will praise God" or "Praise to God". "Odile" is the name of the Black Swan in the classical ballet Swan Lake. It was also the name of a 1994 Tropical Cyclone in the Southern Hemisphere. "Odalie 'Lilli' D'Arceneaux" is the name of the character played by Maureen O'Hara in the 1947 adventure film The Foxes of Harrow, also starring Rex Harrison. After Odalie was born in 1857 the family would have four more children, and unfortunately, more untimely deaths. 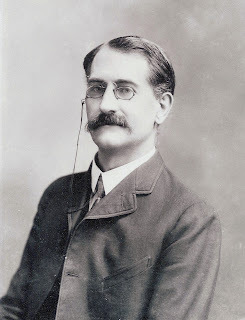 Eighth child Gaston James Fortier was born in September 1860. Only a few months later in December of 1860, the family's oldest child, Alice died. She was just 16-and-a-half at the time. The cause of her death was officially listed as "Cold". There were once again only four children living in the home. In September 1861, Laperle gave birth to twins - Lucian "Lucie" and his sister Luciana "Lucy". It was no doubt a surprise when six years after the birth of twins Lucian and Lucy, Omer, 54, and Laperle, 45, found they were expecting baby #11. But on December 19, 1867, less than a week before Christmas, Omer died. Laperle was left at home to care for six children, ages 6-18, and pregnant with her eleventh. In May 1868, daughter Jeanette was born. Laperle lived just four years more; she died at age 50 on November 1, 1872. Oldest child Adele had married by this time and would have three children before her death in 1886, at the age of 37.The six remaining Fortier children were sent after their mother's death to Mobile, Alabama, to live with their mother's sister Elodie DeGruy Gagnet Mendoza (1828-1914). [See Friday's Forgotten, August 5, 2011, for Elodie's full story] Lucian died in 1884, unmarried, at the age of 23. Omer married and fathered six children, including one daughter he named Odille. A gambler, he died at age 41, in New Orleans in 1897. Gaston married and had four children; he died in 1917. Odalie, my great-great-Grandmother, died in 1920; she was 63 at the time of her death. Youngest child Jeanette married, had one son, and died at age 73, in 1941. Lucy married and had four children; she died in 1942 at the age of 80. Four generations of Horst women make up this family photograph, including my great-grandmother and my great-great-great-grandmother. 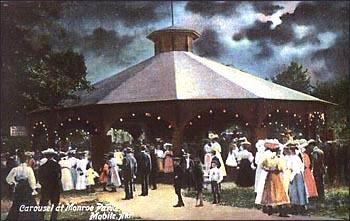 This photograph, made into a postcard, was taken about 1907 at Monroe Park, Mobile's most popular entertainment destination. [NOTE: the name of the park can be seen on the painting of the background.] 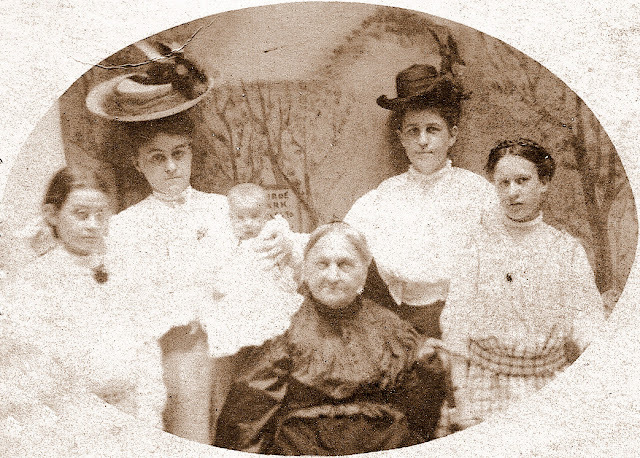 Written on the back of the photograph are their names: "Aunt Dolly, Mama and Pearl, Aunt Appy and daughter Appolonia, Appolonia Horst". Seated in the front center of the picture is the Horst family matriarch, Apollonia Weinschenk Horst (1829-1908), my great-great-great-Grandmother.Standing, from left, are two of Apollonia's granddaughters, Odalie Felice "Dolly" Horst (1896-1990) and Pearl Alphonsine Horst Flemming (1884-1961). Pearl is my great-Grandmother. Pearl and Dolly are the daughters of Apollonia's oldest son, Charles Frederick Horst (1856-1912) and Odalie Felice Fortier (1857-1920), my great-great-grandparents. Pearl and Dolly both lived in Birmingham and obviously were visiting their grandmother and other family in Mobile when this picture was taken. Pearl is holding her oldest daughter, Pearl Alphonsine Flemming, who was born in Birmingham on March 11, 1907 - her father is my great-grandfather Harry Clinton Flemming (1878-1955). Baby Pearl was the first great-grandchild of Apollonia. She is also the older sister of my grandmother Susie Flemming O'Donnell (1909-1989). Monroe Park was established in 1893 near Mobile Bay. It was located east of Frascati Park, once owned and operated by the Horst family until it was destroyed by a hurricane in 1893. 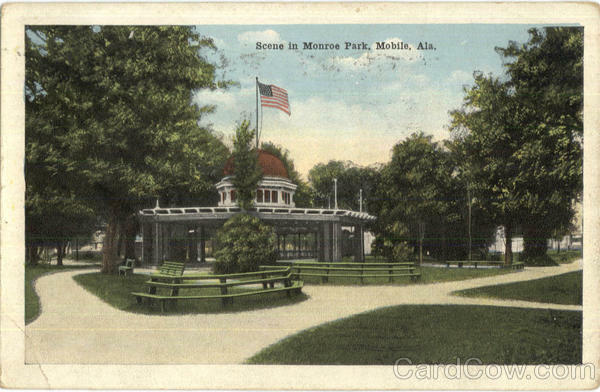 Monroe Park operated in Mobile until the 1940's. Here are two great vintage postcards showing scenes of Monroe Park in its heyday. "Monroe Park" on Mobile Bay is the largest pleasure park around Mobile. It has been the scene of many large gatherings. A large number of church, school and private picnics are given there during the season. Crowds gather nightly to see the free moving pictures, while enjoying the gulf breezes. Another charming vintage postcard shows off the carousel at the center of the park.